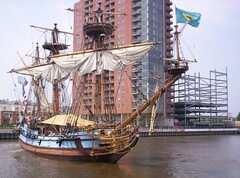 The Kalmar Nyckel on the Christina Riverfront, as seen on the Fourth of July. In the background, riverfront condo-mania. You are currently browsing the CHAZZY(BLO)G blog archives for July, 2006.